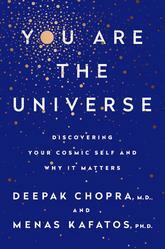 Deepak Chopra joins forces with physicist Menas Kafatos to explore nine of the biggest questions about science and the nature of reality. Their answers will present a bold new understanding of how we can reach our greatest potential. Chopra and Kafatos look to redefine our nature of reality. Here they ask nine questions: What came before the Big Bang? Why does the universe fit together so perfectly? Where did time come from? What is the universe made of? Is there design in the universe? Is the quantum world linked to everyday life? Do we live in a conscious universe? How did life first begin? Does the brain create the mind? Their answers open up new possibilities for all of us to lead more peaceful, and successful lives. Deepak Chopra, M.D., is a pioneer of integrative medicine and the author of more than 80 books published in over 43 languages. Menas Kafatos, Ph.D., is the Fletcher Jones Endowed Professor of Computational Physics at Chapman University. He received his B.A. in physics from Cornell University in 1967 and his Ph.D. in physics from the Massachusetts Institute of Technology in 1972.